A: I was young. When I was 8, my family got involved in Kart racing. We raced at sprint kart tracks around the NW region, then moved on to enduro karts... Collected some trophies and went to the national championships twice. After that, small bore motocross dirt bikes, and sand buggies... Lots of fun as a kid!! A: It made me aware of high-performance handling characteristics and engine power bands. Also, the exhilaration of going fast bit me hard!! Q: What makes volunteering at World of Speed meaningful to you? A: I get to come to “work” and talk about cars all day with knowledgeable people who dig cars!! ...And going fast!! Q: What is the most memorable experience of your time volunteering? A: Hearing the amazing stories from our guests about how they were connected to some of the vehicles in our displays. Everything from Ducati motorcycles, to NASCAR, to drag racing, to unlimited hydroplanes!! Q: What do you wish other people knew about World of Speed? A: First, the school that we have in the back...the best story!! Then, how nicely done the entire museum is!! From the BEAUTIFUL displays...to the museum store...to the “hospital clean” restrooms...it is a joy to be a part of this organization!! Q: If you could choose any vehicle to be displayed in the museum, what would it be? A: Porsche’s!! 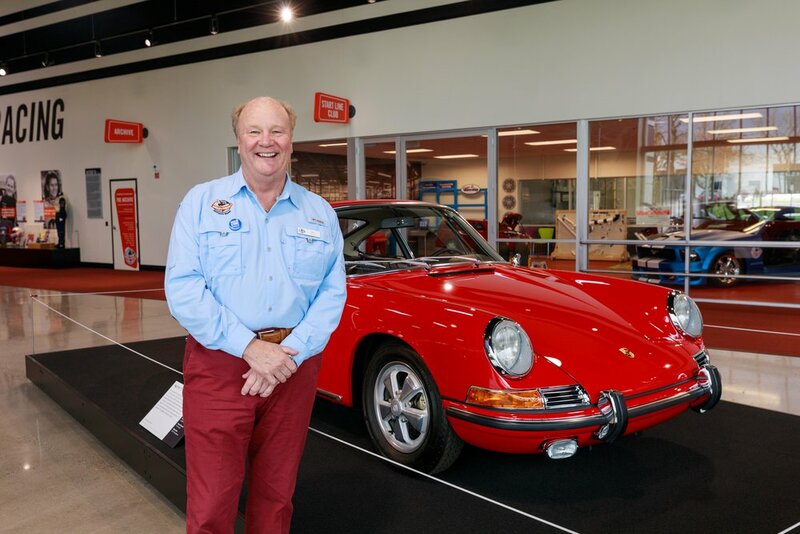 As a Porsche owner and enthusiast, this Porsche display has been like a candy store for me…to enjoy personally, and to talk about with our guests. I would also love to see a race kart exhibit! They are amazing machines! A: That’s easy! The latest and baddest Porsche 911 S...in White ...over Lobster...manual transmission (I don’t know how to drive an automatic transmission).